Four sort-a-thon events have brought volunteers into ITMA since the summer. Two more events are scheduled for November. A visitor to the ITMA library this week asked about music in County Louth. They were shown the books, recordings, videos and images that we have from the wee county but they were also given a box of ephemera that holds Louth-related material. 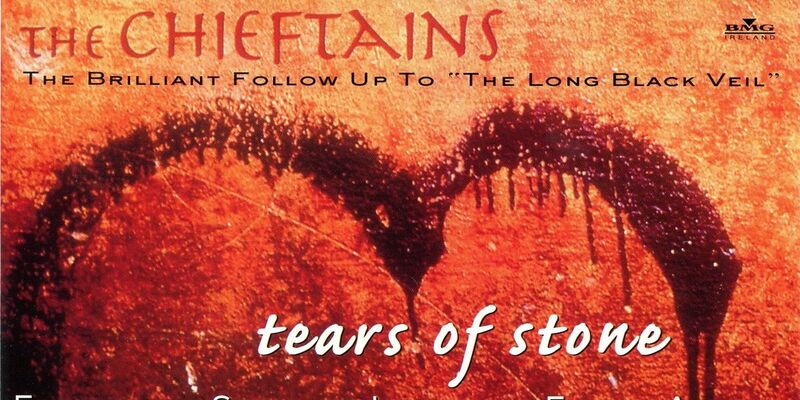 In it is a treasure-trove of material relating to the musical life in Louth over the past 30 years and more: invitations to album launces from La Lugh, Desi Wilkinson and Pádraigín Ní Uallacháin; event brochures from Féile na Bóinne, Ceol Chairlinn, Drogheda Traditional Music Weekend and An Chúirt Chruitireachta; promotional material from the music department of Dundalk Institute of Technology and information about Louth's musical sons and daughters, including Gerry O'Connor, Zoe Conway and our own Nicholas Carolan. Needless to say our visitor was delighted. This material was taken from ITMA's 'ephemera' collection - those 'transient documents of everyday life', brochures, flyers, tickets etc. that are printed for a particular event and then discarded. Since its foundation ITMA has recognised the value of this material and included it in its collections. Much of the material in the Louth box had been in ITMA for many years. However, it is only now that the material is becoming available. At each event staff and volunteers have taken unprocessed and inaccessible boxes of ephemeral material and sorted them by county (and a few other categories). Of the 32 boxes that we started out with, we have sorted through 20. Every county is represented, some more than others. 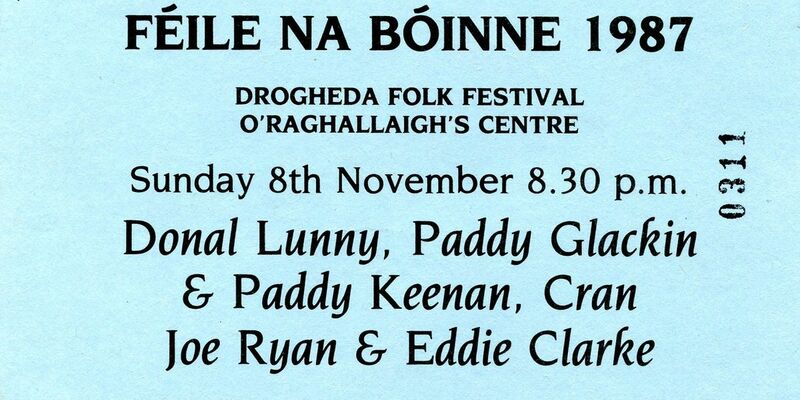 Events such as the Willie Clancy Summer School and Fleadh Cheoil na hÉireann have boxes all to themselves, as do organisations like Na Piobairí Uilleann and Music Network. 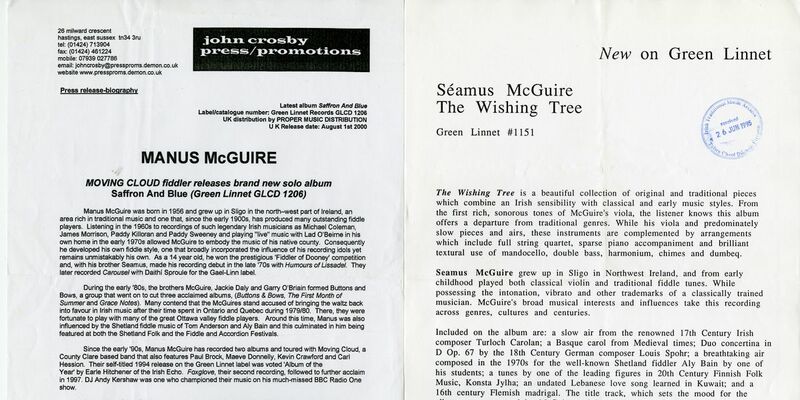 When asked to find material for ITMA's upcoming concert featuring Séamus and Manus Maguire we were able to go to the Sligo box and retrieve press releases for their own solo CDs. There is a wealth of information in these boxes which will open up new avenues for researchers. However, we're not there yet. There is still a lot of work to do. We have 12 boxes yet to sort. After this first pass is finished there will be more work to be done to drill down into the various sub-categories. The multiple Dublin and Clare boxes already have far too much information in them at the moment to be useful - and that's just the ephemeral material. This same method of sorting will be applied to the poster and event programme collections. Two more sort-a-thons are planned for November in conjunction with Explore Your Archive, a week long initiative to encourage interaction with Archives across Ireland and the UK. Would you like to volunteer your time to help us continue this exciting project? Email [email protected] if you are interested in getting involved.